Finding keywords for your search engine optimization (SEO) doesn’t have to be something you dread doing. Don’t let it be too hard or take too much of your time. This easy small business SEO keyword strategy will make your life easier (and cheaper). 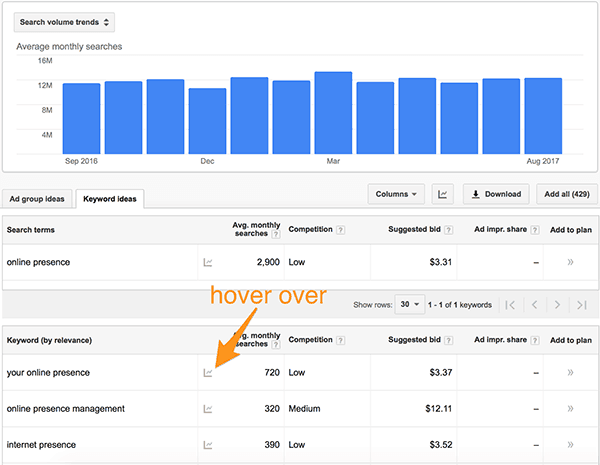 Of course the more (money) you put into SEO the more results you’ll see. But you have a business to run. You may ask yourself if SEO is even worth it for your website. If you’re one of those still questioning the importance of SEO, find the answer if your small business needs SEO. If you have a business website then spending some time on it is necessary. A website alone won’t do anything for your business because people will never find you. That’s because you have no strategy for ranking. You’re either going to have to pay someone to optimize your website or do it yourself. While this strategy is free and easy so anybody can do it, it won’t rank you at the top fast. It is effective though and will get your small business valuable leads rather than just any lead. Who Will This Strategy Work For? The goal of this strategy is to help you find content to write about that will be valuable to your audience. It could be a blog post or a landing page. If you’re serious about producing quality content for your website to grow your business then this strategy is for you. It’s not going to work for you if you’re trying to rank for the term electrician. 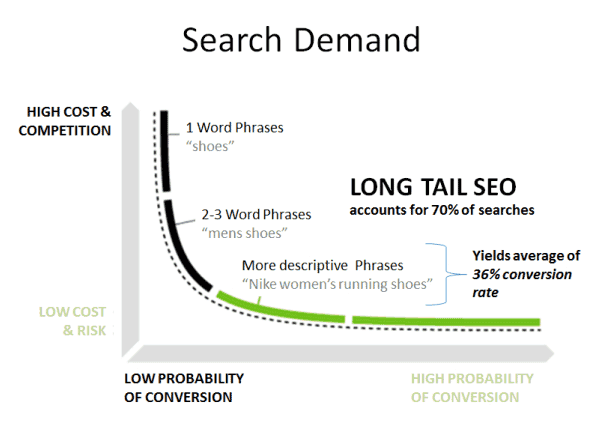 It will work if you want to rank for long tail keywords with quality, helpful content though. See the green section in the image below? That’s what this strategy will help you with. Quality content is how you reach people searching for those keywords. If you want quick SEO success then this strategy isn’t for you. While the small business SEO keyword strategy is easy and free, it’s not a way to quickly rank (nothing will do that for you). You’ll have to dedicate a bit of time to it but anybody can do it. Once you find your keywords from this strategy you have to do something with them. Be prepared to create quality content on your website around the keywords you find. I mentioned it’s free and easy but I also said it’s not quick to rank. You probably want to know about how long it will take you then. You will get out of it what you put in. If you spend an hour every day with your SEO then it’s going to happen a lot faster than if you spend a few hours a week. While this SEO keyword strategy is easy and can take relatively little of your time in the day, it’s not as effective as more time-consuming SEO methods. It is just one part of the SEO puzzle after all. This strategy doesn’t take into account everything else that goes into keyword research. There’s all the writing and promoting the content based on the keywords you find. This is what helps you achieve results faster. Creating good content is a great first step though. You can find good keywords with just a few hours a week. Creating content and promoting it will be the most time-consuming. The time it takes to see results depends. If you spend only a few hours a week then it will take 6 months to a year. If you invest hours every day then it could take less than 6 months to see results. When you create mediocre content then no keyword will perform well and people will never link to your content. Creating amazing content but spending no time promoting it won’t get you ranked quickly either. If you create good content with good keywords then it can take 6 months to a year to start seeing results. You’ll start reducing that time dramatically when you start reaching out for backlinks and promoting your content. With a bit of dedicated outreach then you can start seeing results in less than 3 months. That goes beyond the easy realm though and can consume a lot of time. The time it’ll take you varies dramatically depending on what you invest. 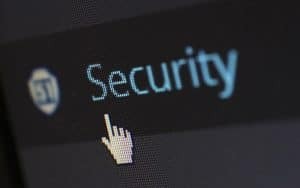 This post focuses on an easy small business SEO keyword strategy though which in itself doesn’t require a lot of time. You need just a few tools so you can get into the strategy. You need just a few tools that are all free for this easy small business SEO keywords strategy. Each of these tools will help you understand your website visitors better. With that understanding, you’ll be able to find good keywords and optimize your current material better for keywords that matter to you and your audience. There are many tools for SEO and I cover 5 important SEO tools but this post covers the core for keyword research specifically. Each of these tools is provided by Google and they’re completely free. If you haven’t set up Google Analytics on your website yet then you absolutely must do it. You’ll see who’s visiting your website, what pages they visit, and more. 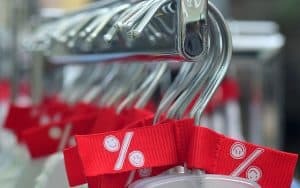 If you have an eCommerce store then you’ll also see conversions and which channels are the most valuable to your store. 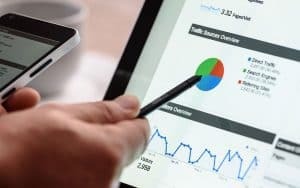 Not only that but you can connect your Google Analytics account with both of the next tools to enhance the analytics reporting (I won’t cover that in this post). For a little more information check out this Google Analytics getting started post for beginners. This is possibly the most underrated tool of Google’s and the easiest to forget about. Google Search Console will let you see the exact keywords people are using to find your web pages. I wrote about Google Search Console extensively in an article about better SEO with your title & meta description. That’s because it’s such an important part of refining your current website SEO keywords. Queries – these are the queries people are using in Google Search to find your web pages. Impressions – This is the number of times you’ve shown up in search results for each given search term. It could be that you were in the 10th place on a page though and a person found what they needed with the 1st. CTR – The Click Through Rate (CTR) tells you out of how many people seeing your page in search results actually clicked on your page. So, if your page was shown 100 times and 10 of them clicked on it your CTR would be 10%. Position – Your page position is the average place your page ranked among all search results for each search term. If you ranked 35th then you’re in the middle of the 4th page because there are 10 search results per page on Google. And you can turn any of these options on or off so you see only the data you want to. If you want to manipulate the data and use it outside of Google Search Console you can, it’s all exportable. I know it sounds a bit funny to mention something from Google AdWords because you have to pay for AdWords. Rest assured though that Keyword Explorer is absolutely free. 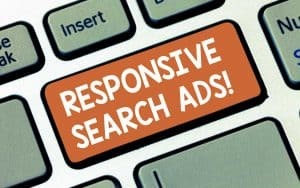 It’s just a tool that’s available inside Google AdWords. Google AdWords Keyword Explorer is meant to be used to find keyword opportunities for advertisers but it’s also great for SEO. You can find keyword suggestions and the number of searches each keyword gets. This is a huge opportunity for you to determine if a keyword is worthwhile or not. It can also provide you with great keywords you should target for your website. If a keyword gets no searches then there’s no sense in targeting it right? Sometimes the keyword you want to target don’t get searches but you’ll find one that’s related and does get searches. These three tools are amazing tools. How can they be so amazing and free? Google is a business, they want to make money. They don’t charge their users money and they don’t charge marketers money to use their free services. That is, Google search and the tools mentioned above are completely free. Google wants to provide users of their search engine with quality results that are better than the competition. They’ve done a great job at that. All the tools they provide for free help you deliver the best content when it matters most to Google searchers. You get the benefit of having free tools to rank better and Google benefits because you are more likely to provide content that meets searchers needs. The money that Google makes comes from advertising. Every search someone performs is likely to turn up relevant ads that people pay to place in Google search results. Ranking high takes time so sometimes it makes sense to pay to skip the line. Some of these tools (specifically Google Adwords Keyword Explorer) were created specifically to help advertisers better reach the right audience for the best deal. Well, it’s a free tool and it just happens to be extremely beneficial to keywords research also. So, each of these toolsise available free because they improve Googles base product, Google Search. Now that you know about my secret weapons for my easy small business SEO keyword strategy, it’s time to put them all together into something useful. Before you do anything be sure to sign up for Google Analytics and install it on your website. Yes, you have to install it on your website but I’m not going to get into those technical details here. Oh, while you’re setting up Google Analytics make sure you sign into Google Search Console and add your website there too. Both of these tools will take a while to start tracking the information you need to continue on with this process. Be sure in Google Search Console that you add ALL versions that are applicable to your website. That includes the http://, https://, http://www, and https://www versions. To make it easier to manage all these versions be sure you add a set that will combine all these versions. This will make analyzing the data much easier. Once you get Google Analytics installed and your website added to Google Search Console, wait a while. You’ll need to get a good handle on what pages people are viewing on your website. Give it about a month. After you get a good month or so of analytics on your website, head into Behavior > Overview in Google Analytics. This will give you a good look at what pages of your website are the most popular. If some of the content on your website is already being found and consumed (you have content right?) then that’s a good jumping off point for more content that people like. So people are finding your content because you can see it in your analytics dashboard. 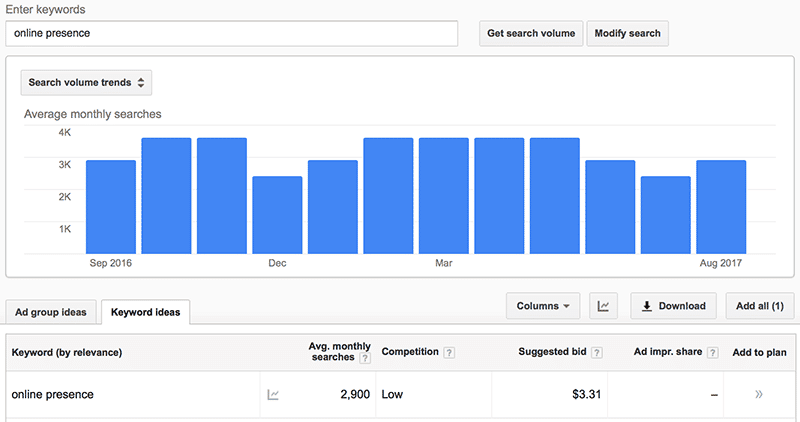 Now you have to find out what keywords they’re using to find your content. This is where Google Search Console comes in. You’ve been collecting data for the past month so now it’s time to put it to work. Head into search console and go into your property or set. Ideally, you set up a set and you’re heading into that. 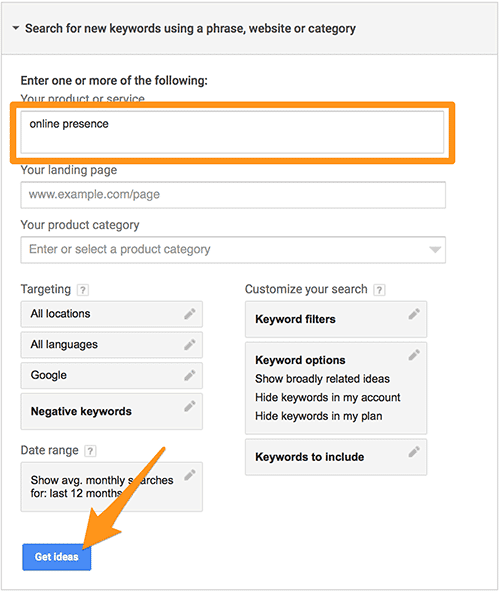 You’ll see your search analytics there so click on the search analytics button. From here make sure you select all the options so you can see all analytics. Now you’ll see all the keywords people are using to find your website. The search console doesn’t show you pages from your website but each query is a link that shows you the search page for that query. Click and see what pages of yours are ranking if you’re not sure from the keyword. There’s a really good chance you’ll know exactly what page people are getting to from the search queries listed though. Make a list of the keywords that are doing well for you. Those are topics that are hot and working for you. You’ll want to find more related ideas for that topic. Now it’s time to take this information and really make it come to life with more SEO keywords for your website. The keyword planner is where this easy small business SEO keyword strategy comes to life. Now you can go into the keyword planner and do a search to get ideas relating to your good keywords. 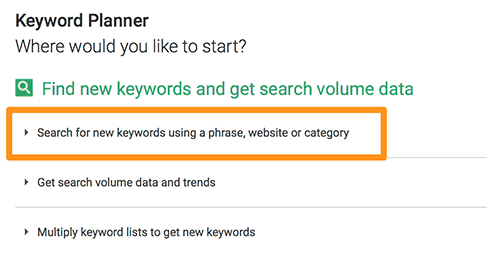 If you just want to find keyword search volume data and trend the middle option is for you. For our purpose, we want to get more ideas to write about and keywords to target on our website. That’s the first option. With the first option expanded you get to type in the keywords you found. You can go one at a time or you can type them all in. Now you’ll have a huge list of keywords. You’ll also see search trends for each term (mouse over the graph icon) and at the top an overall trend graph. Go through this list of ideas and pick out the ones that you could target with your website. You’ll end up with a large list of keywords that you can focus your website content on. Hopefully I haven’t overwhelmed you. These three tools make SEO keyword research a whole lot easier than it could be. When you take these keywords and write new content be sure you focus on crafting a really amazing title. The title is what captures attention and gets people to click on your website rather than someone else’s. 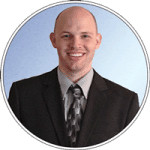 Now you have my secret tools to mastering easy small business SEO keyword strategy. It’s a long post but it’s an easy concept once you get the hang of it. Not only that but the tools are free and it shouldn’t take you more than an hour to come up with a list of keywords that will last you a month. If this isn’t enough and you want more ways to grow your website, ask. Either that or you can get a free online presence analysis. One of the things I check is how your web page SEO is doing and where you can improve. It’s a great way to grow your business online.